Once a climbing superstar expected to win the Tour de France, Nairo Quintana comes up short again, this time at the Vuelta. BALCÓN DE BIZKAIA, Spain (VN) — The Nairo Quintana star faded in stage 17 of the 2018 Vuelta a España. The Colombian classification rider hoped to salvage his season in the Vuelta, starting the race with top billing. Deep in the heart of the Basque Country, with mist blowing over the Balcón de Bizkaia finishing climb, he drifted away from the leaders. He also slipped away from that star status earned by placing second twice to Chris Froome in the Tour, winning the 2014 Giro d’Italia and the 2016 Vuelta. That Vuelta overall win in 2016, two years ago, marked his last big grand tour showing. “The truth is that I had no more strength,” Quintana said today when he came to a stop. “I’m not going to tell lies that I’m sick, because that’s not what it is. I feel like I’m fine, but there was no more strength. Movistar’s top brass listened closely when Quintana finished the Vuelta’s new climb. Boss Eusebio Unzué must now wonder what happened to his promising star. Last year, Quintana played for the Giro/Tour double. He placed second to Tom Dumoulin in the Giro and managed 12th in the Tour. He complained it was too much and wanted a clean shot at the Tour. The team rallied around his 2018 Tour push, but Quintana only briefly shined. After slipping down the classification, he refocused and won the Saint-Lary-Soulan stage. Unzué will be wondering what to do with Quintana in 2019, the final year of their contract together. On Sunday, he acknowledged the pressure is building on the 28-year-old Colombian who everyone tipped as a multiple grand tour winner when he first placed second to Froome in the 2013 Tour. At least in this Vuelta, Quintana admits he has shelved his classification aims. He lost 56 seconds minutes to leader Simon Yates (Mitchelton-Scott) Wednesday and slipped from fourth to sixth. He sits 2:11 back in the overall. 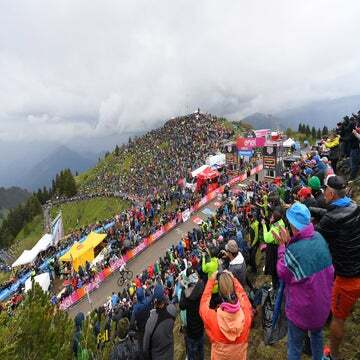 His 38-year-old teammate Alejandro Valverde, who began the race saying he was preparing for the world championships, gained eight seconds on Yates. He remains in second overall, but now at 25 seconds with two more mountain stages.